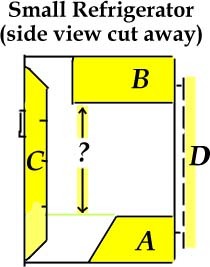 A: Small refrigerators often use this space to accommodate the compressor and other mechanics. This raises the usable floor and shortens the height of your space. B: The freezer compartment will also reduce your height. You cannot remove this unit because it is responsible for the cold air than chills the refrigerator compartment. C: The door usually comes with a molded shelf panel that is used for condiments etc. This takes up space as well, but this can be removed. Simply look under the gasket that seals the door for the screws that hold the panel on. The gasket will come off with the panel. Separate the gasket from the panel and trace the outline of the panel and screw holes onto a piece of ridged plastic or similar material. Cut the plastic and drill the holes. Use the plastic piece in place of the molded shelf panel when you reassemble the door. D: The coils are usually located on the rear of the refrigerator. These coils need ventilation. Purchasing a smallÂ refrigerator with the idea of putting it into cabinetry or under a bar could be unwise because of this, consult the manufacture for more information on this.
? : The size of the keg that you plan to be using should fit in this space. The tallest 1/2 barrel I've come across is 24". bear in mind that you will need to have an additional 5"-6"space to accommodate and comfortably operate the tap and hoses. Home brewers and soda makers often have to accommodate 26'" in height for the kegs they use. Plus the additional 5"-6" space. In order to use a freezer unit for a draft system you will have to have a portable thermostat. This allows you to regulate the temperature so it acts like a refrigerator. Unlike refrigerators, a freezer cannot have holes drilled in any of the sides. If you wish to locate you CO2 tank outside the unit you will need to go through the lid. The sides have coils in them that once ruptured, usually cost more to fix that the cost of the unit. B: Inside the freezer there is a box that contains the compressor and other equipment. this effects the usable space. Be sure to take this into consideration. C: This is a common place to put a tower if the freezer is against a wall. The closer the tower to the front of the lid the wider it will open before the top of the tower hits the wall. D: You can place your tower anywhere on the lid you like if you can roll the freezer away from the wall. Appliance rollers are available in most appliance stores. This is best because the lid can opened all the way depending on how far you roll the freezer out.